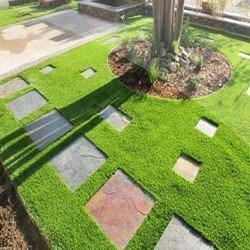 We are a leading Manufacturer of artificial grass for landscaping from Mumbai, India. Sundek Sports System provide a wide range of high quality Artificial Landscaping Grass. Our grasses are made sure to have vibrant grass and in healthy conditions before providing to our clients. We provide care tips and recommendation on how to properly take care of these landscaping grasses. Artificial grass for landscaping has become popular because it resembles grass and gives realistic feel of grass without the requirement of irrigation, fertilizers, mowing and seeding. Our organization offers superior quality Artificial Grass for Landscaping at the cost-effective prices. As now days, Artificial Grass has become very popular in the market to enhance the beauty of gardens, doorsteps, hallways, on the edges of pools, terraces.